Oh My Goodness I have been nominated for the Creative Chaos Award??? 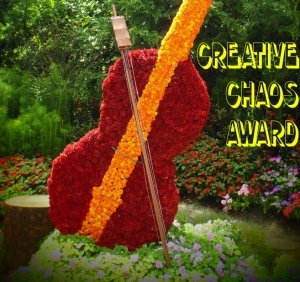 I am honored that Eleenie from Denobears has nominated ME for the prestigious “Creative Chaos Award.” I have never been nominated for anything EVER! So I have some work to do to accept it so here goes. The first thing I have to do is answer some questions, you ready? I collect rocks and crystals. When my hubby and I are camping I usually have more rocks in my pocket than he does. Weird thing? I believe I can feel the energy that lives inside of rocks. I use to lead historical four wheel drive trips in our desert. I know! who knew there was history out there? Sunday’s picture is from an old miner’s house in the East Mojave. Mr. Riley came to live in the East Mojave in the 30’s. He was a butcher down in the Los Angeles area and came with some friends to look for gold, got the fever and never left. He passed away back in the 80’s and is buried about a mile from the house. Weird thing? I am a great 4×4 driver and can keep up with the boys. And we keep a memorial on top of a hill for the dogs and friends we lost. Whew, Had to get that out. Since I am a storyteller I have a hard time posting pictures with no words. Third Task: You find yourself in a desolate place when your car breaks down. You have no cellphone service, no Wal-Mart, and only a candy bar for food. It is 150 miles to the closest town. What color are you underpants and why? Blue! Because I love blue! Chocolate and desolate place? That is what I call dinner and home! Congratulations! I think your blogs are awesome and am glad you have joined me in my father’s journey! Now get out there and share some creative chaos! I love reading people’s answers to these wacky blog award questions. And I don’t think it’s weird to collect rocks and crystals–they’re pretty! And crystals are very cool. Thanks Madame! It was fun! My biggest crystal point is the size of a soccer ball. We go to a big rock and gem show every year in Arizona. I go big when there. A soccer ball?? WOW. That’s so cool! BTW I loved reading this post your answers to the questions. And thanks for “camping out” at my place today! roflmbo! You definitely are a deserving winner, dear friend!! =)) Amongst the chaos of the world, there should be more like yours! ❤ Congratulations! Thanks once again sweet friend. I can always count on you for support! It was certainly fun! Thanks!